We’re only 5 days into autumn and I’ve already made 2 apple crisps, 2 versions of apple betty, and 1 apple strudel. I’ve been getting lots of apples from my fruit share since August! So far, my mom’s favorite apple dessert is the Apple Betty from the Better Homes and Gardens New Cook Book (1996). 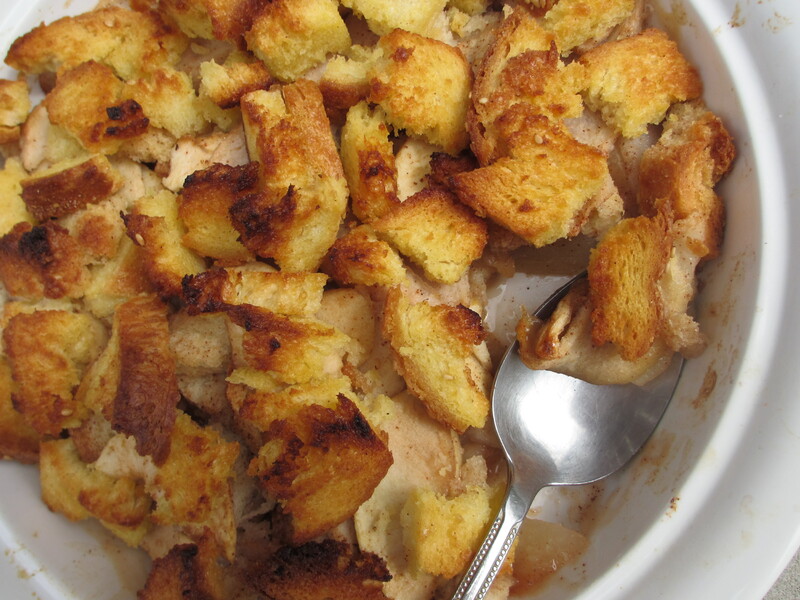 Their version of this old-fashioned, baked fruit dessert uses soft bread cubes instead of dry breadcrumbs. My mom loves the crunchy bread topping! Apple Betty is fun and easy to put together; my mom may even make it with her pre-school class. The children will definitely enjoy tearing the bread into pieces, slicing the apples under adult supervision, and measuring the other ingredients. Sounds like a great lesson! Looks like stuffing, but it’s dessert! 1. (Preheat the oven to 375°F.) For filling, in a large mixing bowl combine sugar, flour, and cinnamon. Add apples; toss to coat. Add 2 cups of the bread cubes; toss gently till combined. Transfer filling into an ungreased 2-quart square baking dish. 2. For topping, place remaining bread cubes in a medium mixing bowl. Drizzle with melted butter or margarine; toss to coat. Sprinkle topping over fruit filling. Bake in a 375° oven about 30 minutes or till fruit is tender and topping is golden. If desired, serve warm with whipped cream. Note: I used Italian semolina bread instead of white bread in this recipe with excellent results. Feel free to use any bread that you have on hand. My pre-Kindergarteners did enjoy the process of making Apple Betty. They looked forward to each step of the recipe. It smelled and tasted great! One of my students, Samuel, even asked for a second serving. The teachers enjoyed it too. Thanks for the recipe idea, Mian.